Perfumes for young children have long been popular in Europe, but are only recently making inroads in the United States. Sales are expected to increase over the coming years as "childhood is increasingly going couture". The idea has yet to catch on in my own house: my son has no interest whatsoever in fragrance, much less couture fragrance, and could not even be tempted by Spongebob Eau de Toilette. If Nickelodeon cannot make a scent to please him, it is a hopeless case. I suspect that many of the children's fragrance purchases in the US are intended as gifts, in which case you could do no better than one of the fragrances by Le Petit Prince, which are as heavy on the charm factor as anything you're likely to encounter in a perfume store. The line is, of course, based on the much beloved 1943 novel by Antoine de Saint Exupéry, and if you are a fan, you cannot fail to be entranced by the adorable packaging. Le Petit Prince (bottle on left) is a unisex fragrance featuring mandarin, orange, tarragon, verbena, freesia, lily of the valley, cedar and oak. The first spray is juicy citrus, after that, it is heavy on the verbena, light on the herbs, flowers and woods. It is a perfectly respectable citrus fragrance; an adult could wear it without shame, but the lasting power is perhaps not quite so good as an adult might expect. All the same, it is perfect for a summer refresher, and would make a nice introduction to fragrance for a child. Le Petit Prince is available in alcohol or alcohol-free versions, both in 100 ml of Eau de Toilette; there is also matching shampoo, body lotion, soap and bath flakes. Le Petit Prince B612 (bottle on right) is for little boys, and is named for the asteroid where the Little Prince lives. The notes include tangerine, lemon, grapefruit, orange, mint, jasmine, moss and musk. This is a more masculine fragrance than Le Petit Prince, but also milder: after a little burst of citrus and mint, it calms to a very soft woody musk. This one comes only in an alcohol based Eau de Toilette spray, 100 ml. As I said above, all of the packaging in the line is simply adorable, but this bottle is easily my favorite. La Rose du Petit Prince is the entry for young girls, and has notes of clementine, orange, bitter orange, grapefruit peel, carrot and celery seeds, tea, rose absolute, moss, amber and cedar. La Rose is a fresh rose, very soft and dewy, with hints of light citrus and a whisper of vegetal green over an woody-amber base. It is light enough that a young girl could spray it on with abandon and still not create much sillage, but the lasting power is reasonable. The bottle features an image of the Little Prince standing next to his rose and has a pink ribbon around the neck. It comes in an Eau de Toilette with alcohol, body lotion and bath gel. All of the fragrances in the Le Petit Prince line are to be officially launched in the United States this coming October. 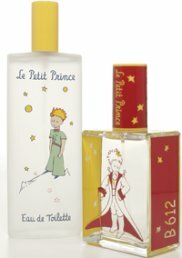 For shopping information, see the listing for Le Petit Prince under Perfume Houses. See also: Guerlain Petit Guerlain and Parfums de Nicolaï Petit Ange. I have no children, so maybe for this reason I have little interest in children's fragrances. However, this line is just adorable. I love the book Le Petit Prince and being a Prince myself, I think that I should make an effort to sniff them….LOL! I like the idea of fragrance for children, mainly because they're already pretty heavily fragranced so it's nothing new. When people say they love the smell of a baby's head, they usually mean the lingering scent of baby products on clean baby hair — that is, hair that hasn't been manked up by cigarette smoke and hormonal sweat. I use Kiehl's hair and body wash foam for babies on my daughter because its scent of vanilla, apples, pears, and berries is wonderful on her little head. I could see giving her a light spritz of some innocent scent between the shoulder blades before dressing her. I wouldn't want to spray her on the arms or anywhere she could reach with her mouth, though. Now you've got me intrigued. I'll have to try these. V, I know I am a sucker for cute packaging, but really, you must have one of these on your dresser. None of the ones above smell exactly right for babies to me, but LPP also makes a younger scent, Les Triples, that is lighter and perhaps better for an infant. And then there is the Le Labo Ambrette, which I also like…although it costs more too. No, not reformulated at all — it is just that they now have a new official US distributor. BTW, I think the LPP in the frosted bottle that you see at some of the discounters is the no-alcohol version. And do tell what other wonderful children's scents you found? My boys are scent snobs! We've tried the “children's” fragrances, and while they do like the idea of having their own fragrance in those fun bottles they always come in, the fact is they always want to raid Mommy's closet o' goodies instead. I think at this point they prefer the complexity of the “big people” perfumes. Plus, there's samples. If Mom is sampling something new, they want to try whatever is the newest thing, too. Heh. I'm raising little elitists! I'm always tempted by the Le Petit line, though. Just for the bottles alone they look so fun. Aww…I'd pretend them I want these for DD, but realy I just want them for myself. I remember trying Le Petit Prince and thinking it was lovely, subtle and fresh. I'm glad that Petit Prince is getting an official distributor here. It's such a lovely line. I really like La Rose. It's an innocent walk through a rose and vegetable garden. For those of us who have a difficult time wearing scents or are highly allergic to various lines, children's scents seem a good way to go. A few years ago I fell in love with a sweet, simple little scent from Crabtree & Evelyn called “Tom Kitten.” It was a bit powdery, of course but simple enough to smell like a sweet toilette water. I eventually longed for something more complex but “Tom Kitten” is still a good summer scent or after shower spray. I'd love to try this line for myself–it sounds very charming. K, I don't know where I went wrong, LOL…all my son says to most every scent on earth is “blech”. I had forgotten that C&E had a children's fragrance, I'll have to look for it. Not sure how I feel about them either, except that if you're going to have one, better C&E or LPP than Barbie, right? I used nothing scented on my daughter's body or head when she was a newborn baby until about 2 or 3 years old. Babies don't need to be cleaned that way, they don't really get “dirty” until much later. And I must disagree with you: babies have a discernable scent of their own. It is very delicate. It is very subtle. It is the most beautiful scent ever. And that is why if I ever have a baby again I will have to refrain from scent for about three years (no scent during pregnancy, and no scent until the baby is a bit older). It would be a huge sacrifice as a perfumer and a perfume addict, but believe me, it's well worth it. Nothing smells as good as babies! I am thrilled and intrigued by these scents! I am going to have to try them, and also get one (at least) for Tamya. She is going to pick it, of course! Hope you will be able to find them! Will be interesting to see what stores pick them up when they officially launch. Thanks, will have to look for both! omg! this is the cutest little thing ever! i have a 5 year old boy and a 18 month old little girl and i use the fragrances for the both of them. my boy always puts it on in the morning and tells everyone in the family to smell him everyday…its so cute!